Plano’s most gentle and complete wildlife service! A All Animal Control of Collin County TX is a nuisance wildlife management company. We proudly serve Plano TX, Plano TX, Allen TX, Frisco TX, Richardson TX, Wylie TX, Murphy TX and nearby cities. Call us at 972-895-9427 for Plano wildlife removal and control services in Collin County, TX. We specialize in the control and removal of armadillos, bats, coyotes, beavers, opossums, possums, skunks, snakes, and squirrels that are native to Plano, McKinney, Allen, Frisco, Richardson, Wylie, Murphy and other cities in Collin County Texas. Count on us for pest wildlife removal from all of the cities in Collin County Texas, Allen, Anna, Blue Ridge, Carrollton, Celina, Copeville, Dallas, Fairview, Farmersville, Frisco, Garland, Josephine, Lavon, Lowry Crossing, Lucas, Plano, Melissa, Murphy, Nevada, New Hope, Parker, Plano, Princeton, Prosper, Richardson, Royse City, Sachse, Saint Paul, Van Alstyne, Weston, Wylie Texas. Our experts can help with Plano Wildlife Removal from attics, basements, between floors, crawlspaces, inside of walls, lawns or yards, under porches and decks, in garages, and anywhere else wildlife finds a home living too close to humans. Plano Texas Wildlife can cause a lot of damage to homes and businesses in different ways. Noises in the attic and scratching in the attic can be from mice, raccoons, squirrels, rats and other wild animals. Skunks and armadillos often make their homes under porches, crawl spaces, and decks, and dig up flower beds, yards, and gardens. Moles will dig tunnels under your lawn and turn your yard into an eyesore. Bats, raccoons, and other animals can get in your attic and quickly contaminate it with feces. In addition to the, often extensive, damage caused by wildlife, humans and pets are also susceptible to many diseases that are carried by wildlife and animals or grow in their droppings. Hantavirus, distemper, histoplasmosis, listeriosis, rabies, and leptospirosis are all diseases that can be acquired by living with or coming into contact with wild animals. In addition to these diseases, having nuisance wildlife in your home often leads to an increase in asthma and allergy symptoms. 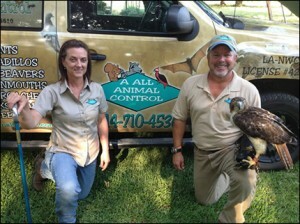 Call us for complete Plano wildlife removal of pest animals from your home and business. We will work quickly and efficiently to eradicate the nuisance pest wildlife, then work to clean up and sanitize the affected area. Our wildlife professionals are also able to provide home repair. We can repair the damage done to your home or business and install preventative measures, such as dryer vent covers and chimney caps. Call A All Animal Control of Collin County Texas, your local Plano wildlife removal professionals skilled at extermination, elimination, eradication, trapping, animal removal, animal control and relocation of nuisance wildlife at 972-895-9427.